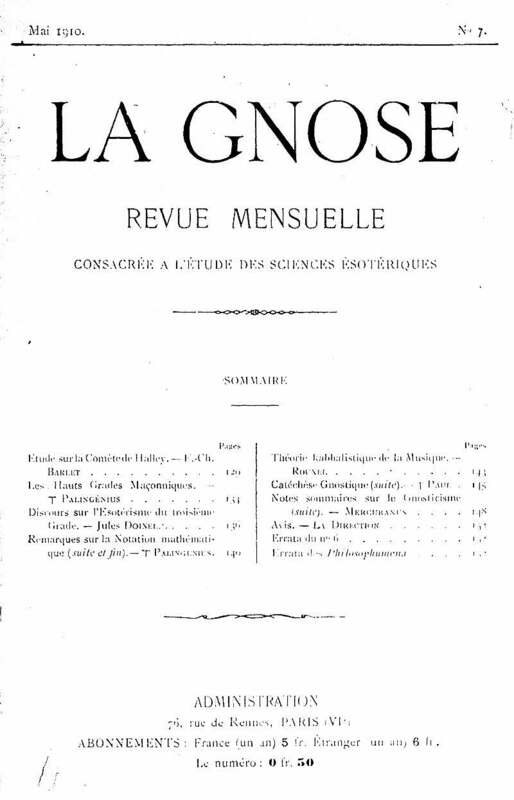 Organe de l'Eglise gnostique universelle / Consacree a l'etude des Sciences esoteriques / Revue Mensuelle Consacree aux etudes esoteriques et Metaphysiques. Paris, France. Language: French. Publisher: Librairie du Merveilleux. Editor: Rene Guenon. 1/1, June 1909-February 1912. This was begun by Guenon and others of the neo-Gnostics after they were expelled by Papus (Gerard Encausse) from the Ordre Martiniste for founding their own Ordre du Temple Renove. On the neo-Gnostics, see the note under Le Reveil des Albigeois. On Guenon and La Gnose and the Ordre du Temple Renove, see the note under Hiram, and also Robert Amadou "L'Erreur Spirite de Rene Guenon ou l'Affaire du Temple Renove," Le Sphinx 3/4-5, Fall 1978. The subtitle of the journal was changed after three issues, apparently after complaints by Johanny Bricaud, the head of the eglise Gnostique Universelle (the body formed in 1908 as the gnostic substrate of what was to become the O.T.O. ), and was changed again in September 1911, presumably to reflect Guenon's views of his own work.